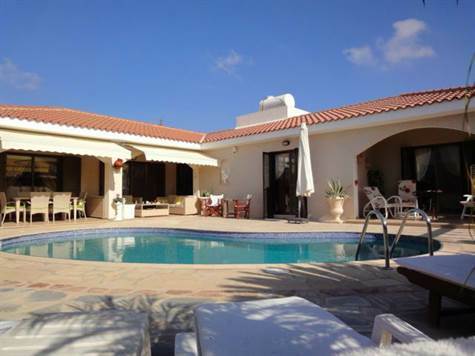 Emba, Paphos - This immaculately presented bungalow is situated in an established residential area near the village of Emba. The local village shops and amenities are within easy walking distance. The property is maintained to a high standard by the current owners and is in excellent condition with high quality finishes. All the rooms are spacious and the layout well designed. The living room with feature fireplace is extremely spacious and has patio windows opening on to a covered terrace. From the dining area an archway leads to the impressive kitchen which is well equipped with built-in oven, electric hob, stainless steel cooker hood, integrated dishwasher and American style fridge/freezer. A separate utility room off the kitchen houses the washing machine and dryer and includes further storage space. All three double bedrooms are spacious and have patio windows providing easy access to the pool terrace. The master bedroom includes a wall of fitted wardrobes and a built-in dressing table. The stunning en-suite features a huge jacuzzi bath, built-in vanity unit and fitted mirror above. The second and third bedrooms also have fitted wardrobes and share a shower room accessed directly from the hallway. The outside areas are very private with hedges and fencing all around. The covered terraces on both wings of the property provide a wonderful place for outdoor dining and relaxing. Sun awnings can be extended to provide further shade when required. The main leisure area has a kidney shaped swimming pool at it's centre with crazy paving and shrubs surrounding. There is plenty of space for sunbeds and a built-in barbecue completes the idyllic outdoor life.